So, between making stuff for me (since the weather is getting pretty cold), making stuff for the upcoming baby, and the holidays, I completely neglected to blog about any of the stuff I’ve been doing. ch 31, turn and hdc in 2nd from hook, hdc 13 rows, go around the edge with 2dc “shells”, doing 2 of then in each corner to keep flat. Cut & weave in. 1 “shell”=4 of either dc or tc. magic circle, dc 12, join with 1 sl. dc 6 shells, doing one in every other stitch. Join with 1 sl. ch 2 for the first dc in the shell, shell 12 total. Join with 1 sl. ch 3, tc 12 shells. Join with 1 sl. ch 3, tc 12 shells. Join with 1 sl. cut off, weave in ends. draw a symmetrical leaf-shape (the kind that’s pointed on both ends) that reaches in length from the breastbone of your “dino” to the base of its tail, from tip to tip. 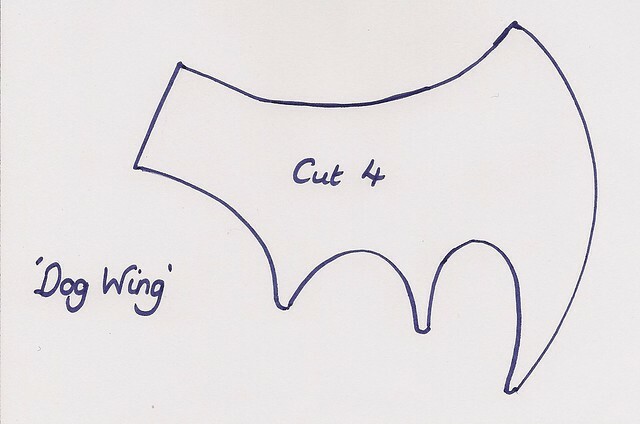 draw a bat wing shape, and cut out 4 of these from the fleece. stack up your wing shapes in pairs. Sew the tops together (you know, the sides with only one point?) and keep as close to the edge as possible. When you get to the end, just sew right of the edge. Start again at the central point of the wing, and sew a line from there to the tips of the serrations in the wings. This should give the effect of the ribs of batlike wings. If necessary, go over these lines more than once. Trim the fabric as close to your wings’ “ribs” as possible. Stuff the beast! You may want to use a chopstick to get the stuffing down into the smaller spaces. Once you have it stuffed (it should look like it’s almost overstuffed), hand-sew the opening in its belly closed. Embroider eyes, or sew on buttons for its eyes. For the spine scallops, blanket stitch along the spine seam, from the crown of its head almost to the end of its tail. Then, crochet shells of 4 dc each, with 1 sc between each shell, in the structure provided by the blanket stitches. I used crochet thread, and a D hook. Previous PostPrevious Yum, Chicken Pot Pie!